Travel is not just a recreational activity that takes place once a year to get away from a hectic schedule and make a photo album that satisfies you until the next trip. It is now a lifestyle, an urge to explore and see new things and places. For many, the definition of traveling itself has changed significantly from vacation packages, pre-designed tour arrangements and spa retreats to exploring the wilderness, taking hikes, trying midnight food-joints, eating at home-based restaurants and uncovering the many hidden gems that never find a space on the vacation brochures. In order to understand travel, one must first talk to the travelers themselves. What do you define as adventurous travel? According to The Intrepid Adventure Travel Index, 1,000 people were surveyed with the intent to find the answer to this question. The results showed that 43.4% of respondents said ‘getting off the beaten track’, which was the most common response. 26.6% of respondents said ‘seeing or doing something new’, 22.5% said ‘high adrenaline activities’ and 6.4% said ‘traveling on a budget’. These statistics show that travel is more than having a new experience; travel is change from the old mundane. Over half of the respondents agreed that their reason for traveling was to recharge their batteries from being so tired and stressed all the time. With that being said, traveling should be fun and stress-free, right? Often times travelers do not have enough time in a city to explore the places that only a local would be aware of. Furthermore, it takes hours to properly research the city, and even then there is still a chance that travelers would not be able to find what they are looking for, the unique aspect that makes the city stand apart and an experience that is best lived like a local. 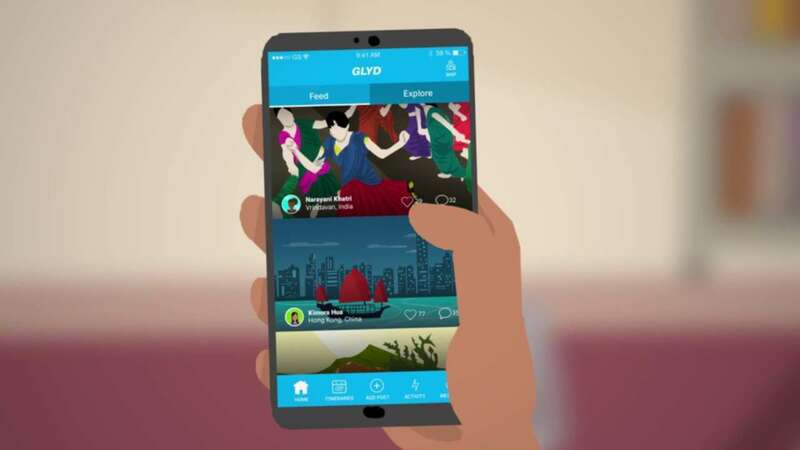 In an age where the traditional jobs do not suffice our hunger for passion and a society that easily gets inspired by male leaders, a female-founded innovative platform, GLYD, provides an opportunity to travel like a local no matter where you go. “I believe people are the heart of a city, the true culture and if we don’t get a change to connect with them, well then, I would say we haven’t really travelled.” says Monika Bhasin, Founder and CEO of GLYD, a travel app based on a social media platform where travelers and locals can post pictures and share their experiences with the world. Through the network individuals have the opportunity to earn extra cash by merely showcasing their city through the app. The platform encourages local communities to not only have a global reach, but a global impact, and is meant for travelers and locals alike. It seeks to grow and nurture the ever increasing number of travelers and locals as well as initiate a direct dialogue between both parties. One of the company’s largest audiences is the millennial generation, known for their efforts to make a mark by traveling to obscure places and recording those moments. This app helps travelers connect with locals and travel to places where the tourists typically don’t go. It has a unique feature for locals to not only showcase their culture and their favourite hide-outs but to also monetize the stories that the city tells by creating personalised digital itineraries. Travelers can contact locals directly and request an itinerary that suits their preferences and interests. Another stand-out feature is that on the traveler’s request, locals can also accompany them as a personal guide in their excursion, providing a one-of-a-kind, authentic experience of the city. In the article, “5 Ways the Travel Agency is Changing in 2018” Allan Smith of the Huffington Post writes, “Though technology is portrayed as coldly unemotional, it can be used to nurture closer relationships and communication between service businesses and their customers.” This travel app is the definition of this communication between travelers and their local counterparts, providing a personal and intimate aspect of travel conversation. Tapping into the experiences of locals and opening the possibilities of seeing a city through new perspectives can redefine travel. Capturing the local, authentic and personal experiences and making them available on a global level is sure to draw globetrotters to the app. These personally curated itineraries have a warm touch as opposed to pre-set packages that are usually sold at higher costs. It embraces the idea of togetherness and makes the traveler, a part of the city life – like a local. GLYD breaks down the language barriers and satisfies the hunger for experiences.